IBM MobileFirst for iOS Expert Resolve provides insights about equipment performance. It recommends solutions and next steps based on equipment service history. 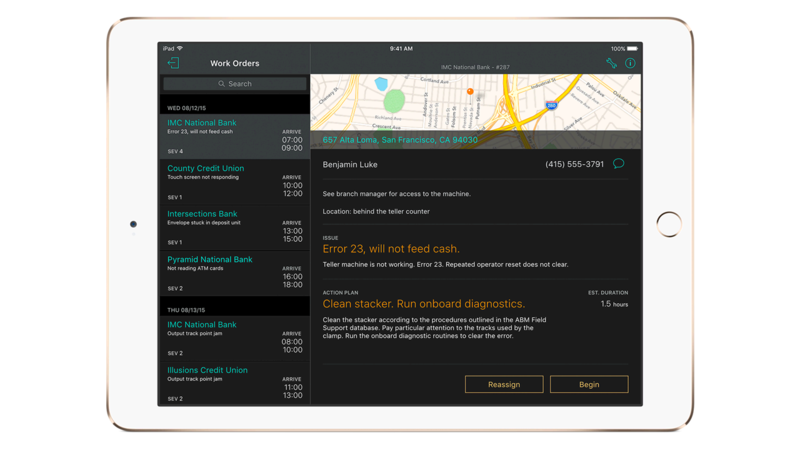 Using powerful analytics, IBM MobileFirst for iOS Expert Resolve generates insights about equipment performance and recommends solutions and next steps – based on best practices and equipment service history. Technicians can make better decisions based on all the information available and can call in the help of outside experts via FaceTime. The app’s analytics provides better issue diagnostics and step-by-step action plans to solve an issue. Expert Resolve gives technicians the ability to more accurately diagnose problems on site – reducing costs, minimizing repeat visits and increasing customer satisfaction. Expert Resolve gives you secure access to equipment service history, customer call records and operating environments. Gain insights on performance and failure rates of similar equipment in the field. The app provides video instructions and just-in-time training. FaceTime allows technicians to consult other experts and show them the issues.